New Lower Price - Save $10! 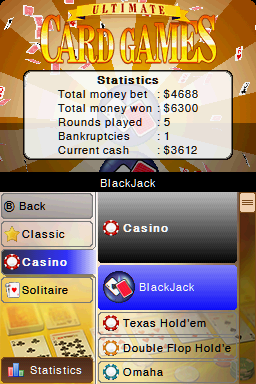 Review on NintendoFuse: "4 out of 5"
Video Review on YouTube: "an easy recommendation"
Telegames, Inc. has again teamed with Cosmigo to create the most comprehensive and feature-rich compilation of Classic, Casino, and Solitaire games ever released for any portable system. 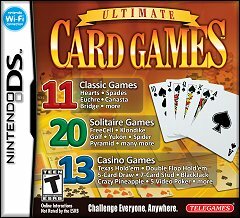 • 11 full-featured Classic card games - select from Hearts, Spades, Euchre, Bridge, Gin Rummy, Canasta, Cribbage, Crazy Eights, Go Fish, Romme, and Skat. • 13 full-featured Casino card games - play your choice of BlackJack, Texas Hold’em, Double Flop Hold’em, Omaha, 5 Card Draw, 7 Card Stud, Pineapple, Crazy Pineapple, and 5 unique versions of Video Poker. 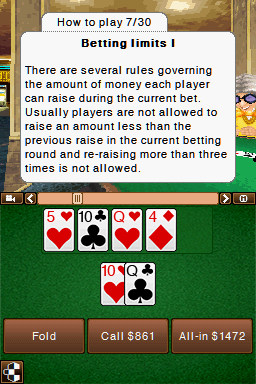 • 20 full-featured and unique versions of Solitaire - select from your favorite Solitaire games like Klondike, FreeCell, Spider, Golf, Yukon, Beleaguered Castle, Forty Thieves, Canfield, and many others. • iPhone™- style menu manipulation and selection using your finger, stylus, or control pad. 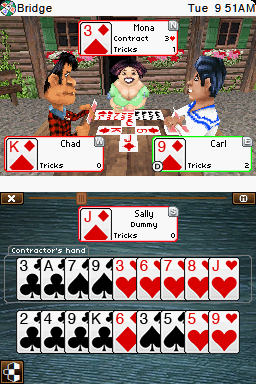 All card games are played on the Touch Screen. • Automatically tracks and saves many of your game stats. • Select your choice of backgrounds from cool pictures and gradients. Select your favorite card faces to use. 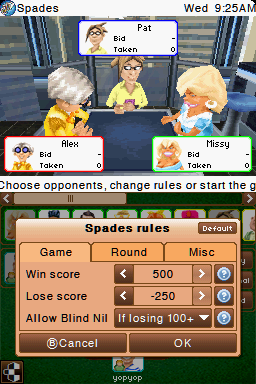 • Customize game rules to play the games how you like it. • Over 45 minutes of original sound tracks. Edit the playlist to only hear what you want to hear. • Single-player options. 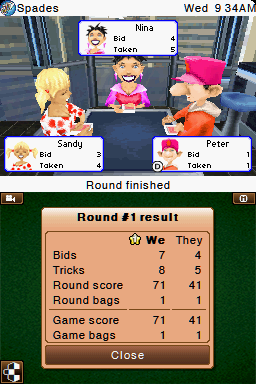 Selectable AI difficulty so your computer opponents will challenge all skill levels from beginner to experienced. 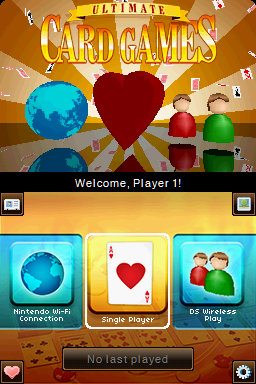 • Multi-player options. 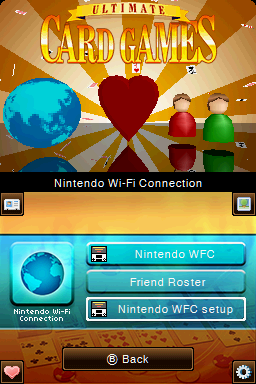 Live multi-player action either locally via Wireless Play or over the internet via the Nintendo Wi-Fi Connection (WFC). 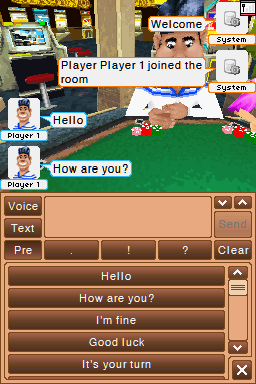 Communicate with other connected players using Text-chat and speech (Push2Talk technology). 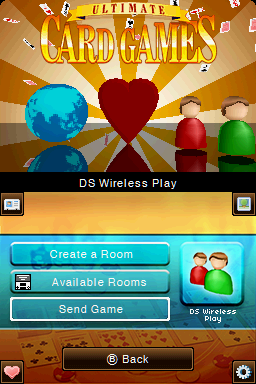 • On-screen "How to play" instructions and button actions. 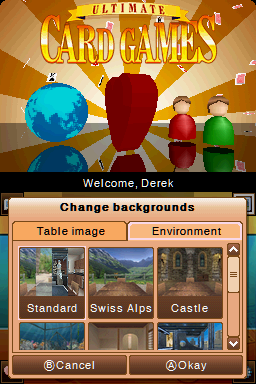 • PC-style menus allow easy and intuitive configuration and navigation. 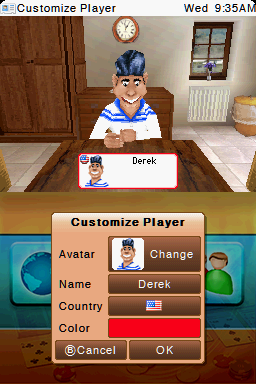 • Select in-game language from English, Spanish, or French language. 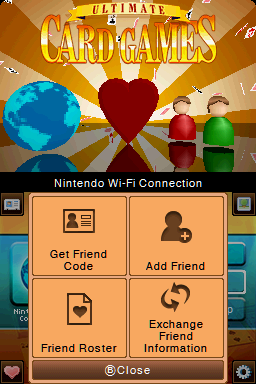 • Game Share feature - wirelessly send the games to your teammates for the duration of one session so they can take part in a multiplayer game without purchasing the cartridge. Order it now at Amazon, Walmart, eBay, or TelegamesDirect.